HDUV - Oesch et al. This summary describes the Hubble Deep UV (HDUV) Legacy Survey data release. The HDUV is a 132 orbit imaging program with the WFC3/UVIS camera onboard the Hubble Space Telescope (HST) designed to obtain deep UV images in the F275W and F336W bands over a total area of ~100 arcmin2 in the central parts of the two GOODS/CANDELS-Deep fields (Grogin et al. 2011). The survey was approved in HST Cycle 22 (program 13872). This image release also includes all the F275W imaging data taken by the CANDELS survey, which were not previously available as high-level science products due to alignment difficulties. Using a novel approach which relies on other images taken in the same HST orbit, we successfully aligned these CANDELS F275W images and combined them with the HDUV survey data. Similarly, to facilitate the most efficient scientific exploitation this release incorporates the UVUDF v2.0 data release from Teplitz et al. (2013) and Rafelski et al. (2015). The UVUDF data were taken directly from MAST and added to the F275W and F336W mosaics in GOODS-S. 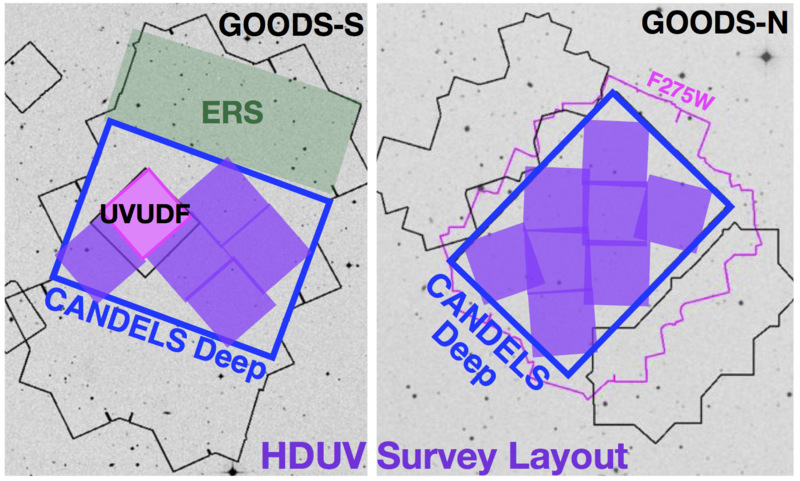 The addition of the HDUV data further enhances the legacy value of the two GOODS/CANDELS-Deep Fields, which now include deep 11-band broad-band imaging from HST as well as very deep ancillary data at all wavelengths from the X-ray to the radio, enabling unique multi-wavelength studies. A detailed survey overview can be found in Oesch et al 2018, ApJS, accepted as well as on the HDUV team page at http://www.astro.yale.edu/hduv. The HDUV survey was designed to efficiently complement and build on previous datasets. In particular, the HDUV is placed in the GOODS/CANDELS-Deep regions which have the best multi-wavelength coverage of all extragalactic fields that are not limited to a single pointing (the latter including the HUDF and the Hubble Frontier Fields, which are covered by different UV programs). The primary observations of the HDUV survey include 10-orbit deep F275W and 8-orbit deep F336W filter images over a total of 13 WFC3/UVIS pointings split over the central parts of GOODS-N and S for a total coverage of ~100 arcmin2. The specific layout in the two fields is shown in the figure below. The pointings were chosen to most efficiently provide coverage in the CANDELS-Deep areas (blue outline), while avoiding overlap with and building around the existing deep UVUDF data (pink). In GOODS-N, the CANDELS/F275W imaging was acquired during the bright part of CVZ visits, resulting in a more extended footprint around the CANDELS-Deep area (pink outline). The following table provides an overview of the F275W and F336W data included in this release. They include the UVUDF data in GOODS-S and the CANDELS/F275W data in GOODS-N.
Notes: Depth measurements correspond to 5sigma measurements in 0.4" diameter apertures and are NOT corrected to total magnitudes (typically a 0.2mag correction). They are averaged over the HDUV survey area. The PSF FWHM ranges from 0.09 to 0.10 arcsec. (**)Area that is covered by at least two exposures including the CANDELS UV data. The 132 orbits of HDUV data were obtained in 42 independent visits between 2014 November 25 and 2015 November 16. In GOODS-S, these visits were composed of 4 or 5 full-orbit exposures in either F275W or F336W. The exposure time of these images was ~2600-2800 s. In GOODS-N, all visits made use of the CVZ. Thus to reach an equivalent 4-orbit exposure, only 2 actual orbits were required for each filter (at the expense of an increased background during the bright part of the orbit). A special pipeline for the reduction of these data was written based on previous WFC3 and ACS data reduction pipelines developed by our team and used, e.g., for the public image release of the XDF and the HLF (Illingworth et al. 2013, 2016). The pipeline is written in python and makes heavy use of the drizzlepac software package developed by STScI, which includes the basic processing steps required for HST data reduction. The WFC3/UVIS images need to be corrected for charge transfer (in)efficiencies (CTE). A pixel-based correction method is provided by STScI, which is applied directly to the raw images. The WFC3/UVIS images were found to show significant structure in their dark images, which clearly shows up when combining images at a depth of several orbits as available here. In particular, the combined WFC3/UVIS images exhibit a significant "striping" along the readout direction when using the standard, non-CTE corrected dark frames (that were available at the time of these observations). To remedy this, a sky dark was computed based on all the exposures for each filter, which was then subtracted from each individual exposure. This procedure resulted in very flat and uniform images. Note that the spirit of the sky dark procedure is similar to the use of the newly developed "self-calibration" by STScI (see Anderson & Ogaz 2014), which constructs delta-darks to be subtracted from each image. Image alignment was performed relative to the F435W images from the GOODS dataset. The HDUV survey was designed to allow for straightforward alignment by obtaining several images of the same filter in a given visit. The relative positions of exposures within a visit are accurate enough that they can easily be combined and cosmic ray cleaned, before a global shift is determined for each visit. The CANDELS UV images required additional steps for alignment, since they were taken exclusively in the bright part of each CVZ orbit, with only one F275W image (of about 1500 s) per visit. A simple visit-by-visit alignment strategy is thus not applicable. However, the CANDELS survey obtained a short ~400 s long-pass F350LP image in each visit immediately before the F275W exposure. Those images contain enough high-S/N sources for an accurate alignment and were used to compute relative shifts that were applied to the F275W exposures. The processed images were drizzled to the same 60mas pixel grid as the 3D-HST images (available here), to enable the most efficient use of these data. The images have dimensions of 17500×19700 pixels in GOODS-S and 20480×20480 pixels in GOODS-N. The table below lists all the programs from which data have been included in this image release. 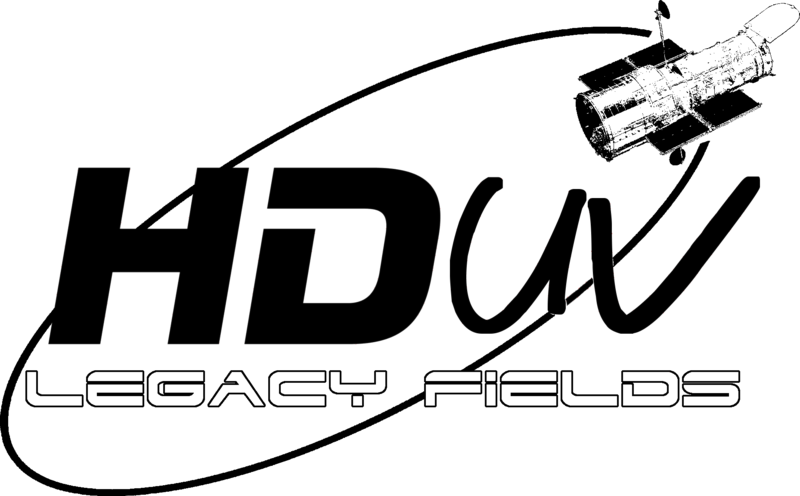 This HDUV data release includes the final drizzled images of the completed HST dataset as well as a source catalog in both fields. In particular, the dataset covers 6 pointings of WFC3/UVIS images in the GOODS-S and 8 pointings in GOODS-N at full 8-10 orbit depth for a total coverage of almost exactly 100 arcmin2. The GOODS-N images also include a shallower component around the primary pointings which was taken as part of the CANDELS survey. The images are drizzled to the same pixel frame as the GOODS/CANDELS images released by the 3D-HST team in order to make multi-wavelength analyses by the community particularly easy. The data release described here includes the F275W images from the CANDELS survey in GOODS-N as well as the UVUDF in GOODS-S. The UVUDF was matched to the HDUV pixel grid using swarp and then combined with the data using inverse variance weighting in the overlap regions. The following table provides links to the science and rms images for download. Interactive displays are available for each image. The pixel values of the science images report the flux count rate calibrated in electron/second. The zero points to convert the count rate into AB magnitudes for the two fields are listed below. They include a correction for Galactic dust based on Schlafly & Finkbeiner (2011): E(B-V) = 0.0069 mag and 0.0105 mag for GOODS-South and North, respectively (see here). The rms maps are generated based on the AstroDrizzle weight maps and provide the root-mean-square noise fluctuations per pixel. The rms maps have been corrected for correlated pixel noise that is introduced during the drizzle process, as discussed in Casertano et al. (2000) (see especially Section 3.5 and Appendix A). The image depths are derived directly from the images by placing a large number (10,000 per field) of circular apertures in empty sky regions of the HDUV images and measuring their enclosed flux. The dispersion of these flux histograms represents the most accurate, empirical measurement of the average image depth. Using 0.4 arcsec diameter apertures, we measure 5sigma depths of 27.5 and 27.9 in the two filters F275W and F336W, respectively, averaged over the full HDUV survey footprint (see also table above). Preliminary photometric catalogs spanning the HDUV survey footprint are provided in this release. The catalogs include photometry, photometric redshifts, and stellar population properties. They are built on the catalogs of the GOODS fields that were released by the 3D-HST survey team (described in Skelton et al. (2014) and available here). The UV photometry is consistently derived to match the 3D-HST photometry, following the same methodology and detection images used in Skelton et al. (2014) and summarized here. Catalogs are derived from PSF-matched images. To this end, the HDUV point-spread functions are derived for each band separately using the software PSFex (Bertin 2011), and a kernel is derived to match these to the lowest resolution HST image in the GOODS/CANDELS fields, i.e. the F160W band. Following Skelton et al. (2014), sources are detected at near-infrared wavelengths based on a noise-optimized combination of the WFC3/IR F125W, F140W and F160W images using SExtractor (Bertin & Arnouts 1996). Photometry is measured in circular apertures of 0.7 arcsec diameter on the PSF-matched images, and is corrected to total fluxes using the same correction factor as employed by the 3D-HST catalog. The source IDs are matched to the 3D-HST source catalogs in the two GOODS/CANDELS fields, given that they are based on the same detection image. The catalogs are trimmed to the HDUV survey footprint (including the UVUDF in GOODS-S), however. To make these catalogs most useful, the flux columns of the 3D-HST survey catalogs are repeated as well. In total, the catalogs thus contain 2 new filter fluxes (F275W and F336W) and their associated flux errors, plus 40 and 22 HST, Spitzer/IRAC, and ground-based filter fluxes in GOODS-S and -N, respectively. Photometric redshifts and physical parameters are derived based on SED fitting to the full filter fluxes available for each source using the same template set and procedures as the 3D-HST catalogs. In particular, photometric redshifts are based on the code EAZY (Brammer et al. 2008) and physical parameters are derived using FAST (Kriek et al. 2009) using a template set from Bruzual & Charlot (2003). For more information on these procedures, see Skelton et al. (2014). The source catalogs can be downloaded using the links in the following table. A short readme file is provided to explain the different columns. The team members involved in the HDUV survey are: P. Oesch, M. Montes, N. Reddy, R. J. Bouwens, G. D. Illingworth, D. Magee, H. Atek, C. M. Carollo, A. Cibinel, M. Franx, B. Holden, I. Labbe, E. J. Nelson, C. C. Steidel, P. G. van Dokkum, L. Morselli, R. P. Naidu, S. Wilkins. For questions and more information about the data reduction pipeline, please contact: hduv.survey@gmail.com.